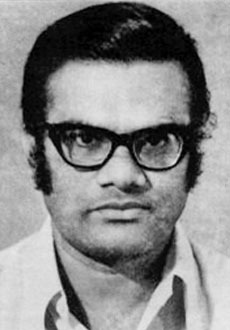 Alamgir Kabir (December 26, 1938 – January 20, 1989) was a Bangladeshi film director and cultural activist] Three of his feature films are featured in the "Top 10 Bangladeshi Films" list by British Film Institute. Kabir was born on 26 December 1938 in Rangamati. He completed the matriculation in 1952 from Dhaka Collegiate School and the intermediate in 1954 from Dhaka College. After completion of bachelors from the Dhaka University in Physics, he went to England to study Electrical Engineering at Oxford University at the age of 22. During his stay in Oxford University he came across the The Seventh Seal by Ingmar Bergman. He watched it several times and became attracted to filmmaking. He went to British Film Institute to complete a number of courses on the history of the film industry, film direction and aesthetics. After the war of independence, he started making feature films.During 1981-82 Alamgir was the Co-ordinator of the Film Appreciation Courses organized by the Film Institute, Government of Bangladesh. Alamgir drowned at Jamuna River at Nagarbari ferrighat when returning from Bogra after attending film seminar on 20 January 1989. Kabir married Manjura Begum in 1968. After separation from her, he got married to actress Jayasree Kabir in 1975. He had three daughters. Elora Kabir is one of the daughters. Sohrab Lelin Kabir is only the son.